WordPress opens countless possibilities for creativity and commerce because of its flexibility. You can build almost anything on the web with the right combination of themes and plugins. With WordPress sky is the limit. The best part is you need not be a developer to build a website. 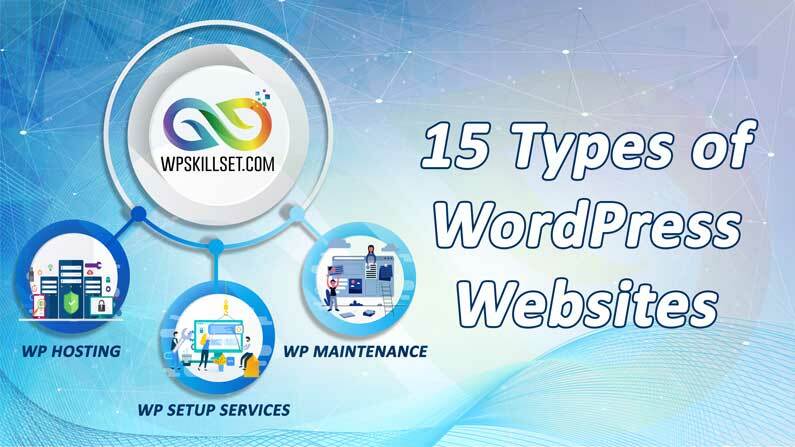 Here is a list of amazing types of websites that is built on top of WordPress. WordPress started out as a simple blogging platform and quickly evolved into a full-fledged Content Management System. This was the original reason that WordPress was created, even though it could be used for so much more. The main benefit of using WordPress for your personal website or blog is that you do not need any experience building websites. You will find plenty of tools to manage and grow your WordPress blog quickly. WordPress is the easiest way to build a professional looking business website. It is so powerful that many big-name brands are using WordPress to power their websites. If you want to create a professional website without spending lots of money on web design then WordPress offers a simple solution. You can choose from thousands of business themes for your WordPress site and then tweak the layout to represent your business. WordPress is quickly becoming the go-to solution for building an e-commerce website. There are awesome plugins that convert your WordPress website into a fully functional e-commerce platform. These plugins and themes will allow you to accept payments through your website, add a shopping cart, and manage your inventory. You can accept payments, manage inventory, shipping, taxes, and users from the same platform. Starting a news website with WordPress is very easy. There are hundreds of free and premium themes and plugins available to add different features. You can use categories and tags to make it easier for readers to find content. WordPress is also SEO friendly so that you can focus on publishing quality news and magazine articles. Want to create your own version of Yahoo Answers or Quora? With WordPress you can easily create your own version of the question and answer site. Combine it with other tools, and you can build yourself a thriving online community of your own. WordPress powers thousands of schools and college websites around the world. It is safe, secure, and easy to manage. You can easily design a professional website for the school or college by adding resources which the faculty and students will find useful. Wikipedia-like or knowledge base website can easily be implemented with WordPress. One of the great features of WordPress is the ability to use categories and tags to categorize your content. It is also easy to add internal links to other posts and documents. This is very useful when setting up a knowledge base that will contain a lot of posts. Create a job portal using WordPress. WordPress allows you to easily create a job portal where employers can post job listings and professionals can respond to them. There is a growing demand for niche job boards catering to the needs of a specific industry or specialization. Have you ever wanted to build a Business directory website similar to Yelp or White pages? Use WordPress to a creative business directory website. Just like job boards, there is an increasing demand for niche business directories on the web. There are lots of great WordPress business directory plugins which will help you in implementation. Showcase your talents with a portfolio website. You can easily add a portfolio to your WordPress site with stunning galleries and beautiful sliders. There are hundreds of premium and free WordPress themes for setting up your own online portfolio. This allows visitors to be drawn in by your art, design, crafts, or products. As with portfolio themes for WordPress, you will have a large variety of photography themes to choose from. These also focus on the images used on your website, instead of the content. Easily upload your photos and display them right on your homepage. There are also tons of photography templates available for WordPress. You can add galleries, albums, titles, captions, lightbox pop ups and slide shows. WordPress can help you build membership websites quickly and easily. There are a few popular WordPress plugins to build membership websites with WordPress. You can charge a small annual membership fee and offer your members/users special perks for different levels of membership. Use WordPress to create a coupon site. It allows you to easily add, manage, and expire coupons. Coupons website can become a nice source of passive income. Earn affiliate commissions from thousands of websites offering special discounts on their products and services right from your website. Just like coupon website, an affiliate website is another way to make passive income online. You’ll get commission for referring your users to products and services online. With WordPress, you can use a SEO plugin to increase your search engine rankings and draw more visitors to your website. There are many resources available for boosting traffic, including social media plugins. Another type of website that you can make with WordPress – Online Community Forums. Allow others to post in the community. There are plenty of useful resources available for building an online community with WordPress. You can even add social features to a WordPress site with plugins like BuddyPress.